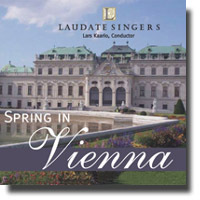 Spring finally arrived in Vancouver last Friday evening, albeit in the form of a “Viennese Spring” provided by the magnificent voices of the Laudate Singers. Artistic director, Lars Kaario, playing on his own turf (he is also the head instructor in Capilano College’s Conducting Certificate Programme) coaxed some of the best choral music heard on Vancouver’s North Shore from this local choir with exhilarating ensemble, amazing clarity, and superb balance throughout. The first half was entirely dedicated to Johannes Brahms’s Achtzehn Liebeslieder (18 Love Songs). Sung in German, the songs varied in both length and complexity, with only two featuring a soloist. Alto Jennifer Stephanson offered a lugubrious rendition of Wohl Schön Bewandt, an ode to an unaffectionate suitor. During a 30-minute intermission, the audience was invited to the college lobby to mingle with members of the choir in a church-hall style gathering over a glass of Austrian white wine and a selection of specially prepared Viennese pastries. The ensemble returned with female members donning a variety of colourful pashmina scarves to perform selected highlights from Lehár’s The Merry Widow. When Franz Lehár died in 1948, operetta, as a live stage form, all but died with him giving way to the burgeoning American stage musical and while one cannot deny a certain frivolity associated with The Merry Widow, it remains at the zenith of Viennese operetta. Any selection from this work simply has to include Vilja, Oh Vilja and soprano Heidi Ackermann delivered one of the concert’s best moments with a glossy, yet sensitive interpretation of this popular showstopper. Dein ist mein ganzes Herz (You Are My Heart’s Delight) may be the only song that anyone knows from Lehár’s other well-known operetta, The Land of Smiles and may even be the most famous aria in light opera. Tenor Mark DeSilva certainly did it justice with an even delivery, though he occasionally strained in high registers. The singers wound up their program with an entertaining selection from Johann Strauss’s Die Fledermaus which included the effervescent Fiery Evening Sky as well as the ridiculously frivolous Laughing Song. The elected soloist fulfilled their roles with abundant high spirits, none more so than Alto Jen Lee, who would hardly ever be mistaken for a man, performing as the Russian Prince Orlofsky. Gaye Alcott and Bernard Duerksen jointly provided sparkling accompaniment on a single Kawai grand piano for the Brahms segment; though it was only Ms Alcott who returned for the operetta selections in the second half. In the thirty-two songs performed, some sung in German, some in English and even one in French there were some affecting moments, many of these coming from the singers' musical understanding and cohesive balance.